All models in the LPT series of transmitters that come standard with a water / dust tight, corrosion resistant ABS / polycarbonate enclosure with a hinged, secured door. An optional splash guard is also available for water spray or wash down applications. Automated calibration and other maintenance procedures are simple and easily performed in the field, and our proprietary Calibration Extending Firmware (CEF) takes into account the aging of the sensors so that less frequent calibrations are acceptable in non-critical applications. 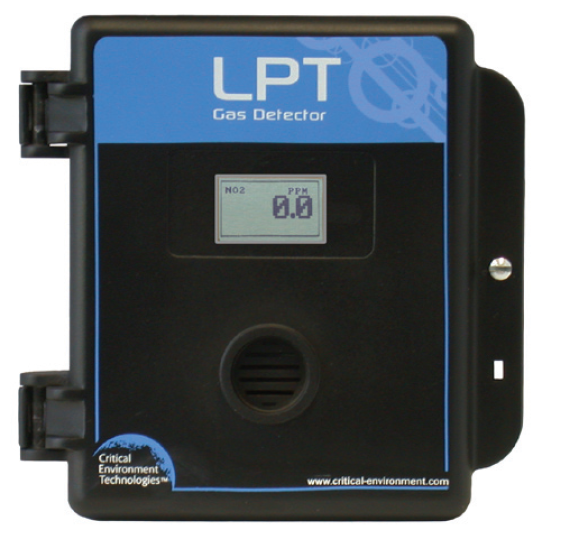 The LPT-A is an economical, single sensor, analog transmitter available with a wide range of sensors and sensor types including electrochemical, solid state, and catalyic. It features three-wire VDC or four-wire VAC power, jumper selectable 4 - 20 mA or 0 - 10 VDC analog output, standard dry contact relay (2 amps @ 30 V SPDT), automatic thermal resetting fuse, temperature compensation, back lit LCD digital display, and audible alarm, all in a RoHS compliant package.